Lucky Charms manufacturer, General Mills, is celebrating the sugar-laden cereal's 50th birthday this year. Well, why shouldn't mega-corporation General Mills celebrate? Lucky Charms is the 10th best selling cereal in the U.S., a stand-out milestone in a lucrative product field of hundreds upon hundreds of breakfast cereals. Very few fake foods have achieved such lofty sales volumes. "IRI, a Chicago-based market research firm, estimates that Lucky Charms sales this year are up 14.5 percent to $145.9 million so far. By contrast, the company’s overall U.S. sales were up just 2 percent in the latest quarter and 1 percent in fiscal 2013." A reason for the newest upsurge in Lucky Charms' popularity? Adults, who were targeted in clever new marketing campaigns. "The company claims more than 40 percent of Lucky Charms eaters are adults," per Businessweek. What was General Mills thinking? What was General Mills ("GM") thinking when it created Lucky Charms? Was child nutrition or public health ever seriously considered? 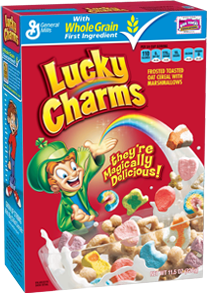 Or is Lucky Charms the perfect poster child for industrial-made junk food aimed solely at maximum corporate profitability? Seems that Lucky Charms was created on a dare in 1962 by GM Research Labs to Vice-President John Holahan. A business dare to create a new product in six months, rather than the usual two to three years, and for that product to use existing manufacturing capacity at its Cheerios or Wheaties plants. Three enthusiastic focus groups of mothers and their young children, and GM ignored its normal product-development protocol process to rush Lucky Charms into supermarkets across the nation. Exuded one mother, "If it keeps the kids quiet and happy at breakfast, bring it on!" 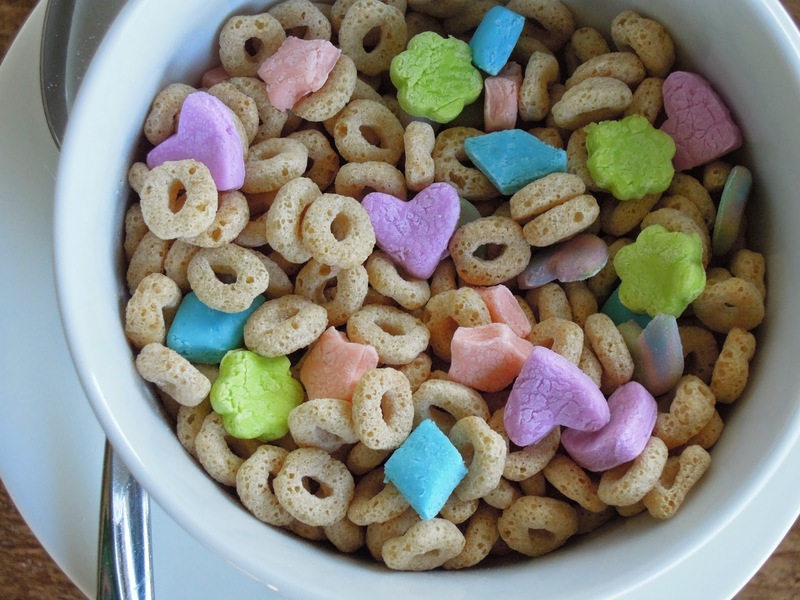 Marbits, short for marshmallow bits, are and always have been 25% of Lucky Charms cereal. But that apparently wasn't enough sugar to "keep the kids happy at breakfast." Was child nutrition or public health ever seriously considered? No, apparently neither played any role whatsoever in GM's creation of Lucky Charms cereal. Is Lucky Charms the perfect poster child for industrial-made junk food aimed solely at maximum corporate profitability? That's the logical conclusion. What is General Mills celebrating? So what, exactly, is General Mills celebrating when it joyously marks the 50th birthday of its Lucky Charms cereal product line? Clever marketing, especially to children. Very long sales life. Addictively sugary taste, ensuring repeat buyers. Fast-track product development. Hefty profits for mega-corporation General Mills. Nutrition for kids be damned. Public health be damned. 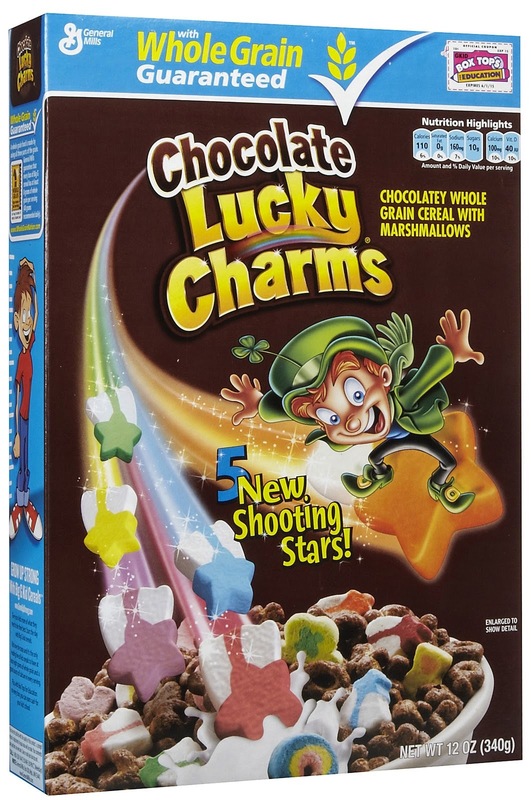 Mere impediments to corporate profits from Lucky Charms, perfect poster child for industrial-made junk food. Happy Birthday to Lucky Charms for 50 years of fat profits and fat kids! "is Lucky Charms the perfect poster child for industrial-made junk food aimed solely at maximum corporate profitability?" Yes, plus there's the whole issue of using schools to market it via Box Tops. Yes, the Box Tops is a big issue. It takes me months to turn in just a few Box Tops because most of the food products they are found on are not ones that we choose to eat. Thankfully they are also found on some paper products and things like T-shirts. If they were found on apples and bananas I would turn in dozens every month. Lucky Charms was recently used on St Patrick's Day in my son's classroom. Apparently they were using it to make a craft of some kind. I was furious!